There is a massive storm that blew in off the Pacific ocean earlier today. Here's a radar capture from NOAA as of 6:30 CDT Monday. I know, it doesn't look THAT bad right? Here's the weather warning map that goes with the above radar though. The teal color in California is a freeze warning. The light purple color that extends from there and touches 13 states is a Winter Storm Warning. The dark purple/blue in the middle of the country is a winter weather advisory and it includes a bunch of states that have thus far escaped the warning. The red spots are Blizzard Warnings and they are active in 6 states including Minnesota. 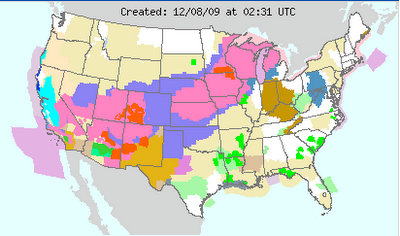 The purple in the middle of Texas is freezing rain. There are winter storm watches in six additional states on the East coast. All told, the map above shows watches or warnings in 22 states related to this system and the number will likely climb in the coming hours as the storm progresses. Before posting this I went outside and did some repairs to the snow thrower and fired it up. That's one of these for those readers in warmer climates. It finally started on the seventh try and belched smoke down the alley. In honor of the climate talks in Copenhagen starting today, I'll discuss the evils of two-stroke gas engines in a post later this week. Forgive me, my back is awful and I can't afford a new more eco-friendly snow thrower.